A section of the West Pier, in Brighton, has collapsed into the sea. A temporary walkway connecting the concert hall and the pavilion completely collapsed at about 0920 GMT on Sunday. Geoff Lockwood, chief executive of the West Pier Trust, said: "What we don't know is what will happen now - it is a grand old structure and it has survived for a long time so it might be okay." The pier, built in 1866, had been in a state of disrepair for many years and was closed to the public - nobody was injured. 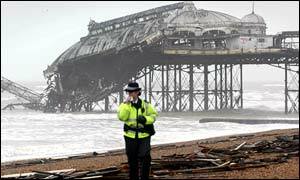 A spokeswoman for Sussex Police said the weather in the area was wet and windy at the time. Council officers are at the scene attempting to clear debris from the beach. Solent Coastguard said that a unit was standing by near the pier to warn passing boats of debris and planks of wood floating in the water. The West Pier is one of two piers at Brighton - the other is the Palace Pier which is open to the public. The West Pier Trust has spent about �1.5m strengthening the pier in preparation for restoration work. The main restoration had been scheduled to start in summer 2003 and was due for completion in 2005. The pier has been closed to the public since 1975 because of fears it may collapse. Mr Lockwood said some of the original poles holding the concert hall in place had also fallen into the sea. This had left part of the hall hanging precariously at a 30-degree angle towards the sea. Mr Lockwood said: "Unfortunately, the engineers can't get out there to have a look until the New Year so we won't know how bad the damage is until then." He added that even if the concert hall fell into the sea, it would not stop the �30m restoration project continuing. "Brighton's ageing West Pier succumbed to one final stormy night"
"The southern part of the main middle building... was gradually subsiding"